This is truly the most wonderful time of the year. There are so many things to see and do all over Southern California. Many of these events are free to attend and I love being able to share those places with you. One of my favorite free events is The Mission Inn and Spa in Riverside is home to the Festival of Lights. More than 3.6 million (Yes Million!) lights transform this beautiful hotel into a holiday wonderland. The festival features nightly live entertainment, “fresh snow”, and even appearances by Santa and his reindeer. You can even ride around a horse drawn carriage around the hotel grounds. The City of Riverside has adopted The Mission Inn’s Festival of Lights as a citywide initiative with a vision of a Dickensian holiday spectacle featuring lights and decorations throughout downtown Riverside, an outdoor ice-skating rink on the Main Street pedestrian mall, holiday vendors and family-friendly entertainment. 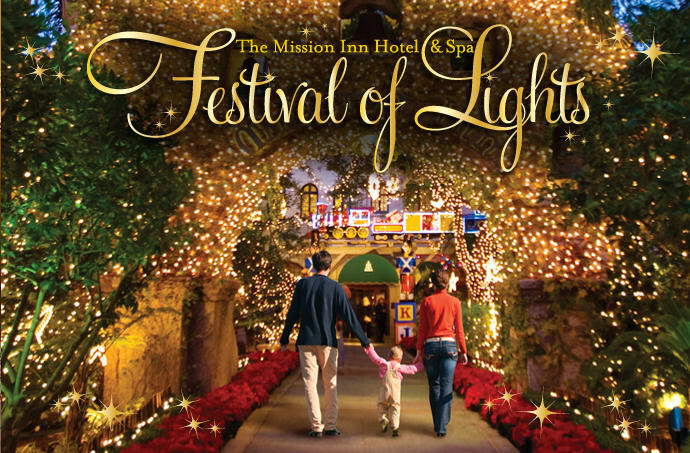 The Festival of Lights at The Mission Inn Hotel is now open and continues until January 6th, 2015. The Festival of Lights begins every night at sunset. For additional information head here. This entry was posted in Christmas Activity, family festival, Festival, Free. Knott’s Merry Farm is once again been transformed into a magical wonderland just in time for Christmas. You may not know this but Monday through Thursday admission is free into the Christmas Crafts Village inside Ghost Town. 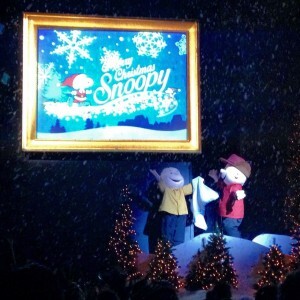 On a recent visit to Knott’s Merry Farm we had the opportunity experience the news ice skate show Merry Christmas, Snoopy! 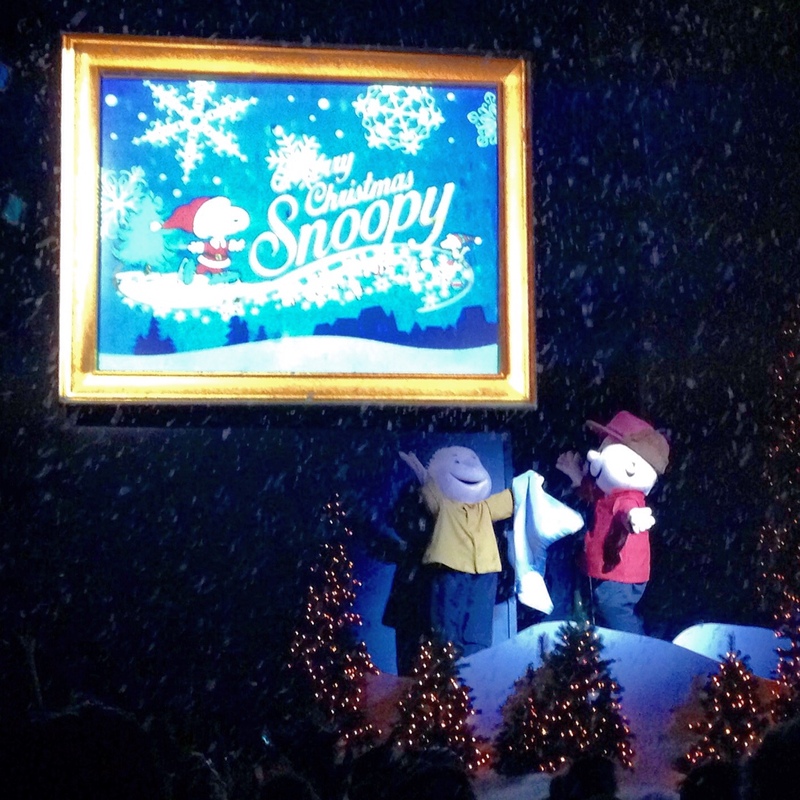 The show is wonderful with ice dancing and features vignettes with Charlie Brown, Linus, Lucy and Snoopy. There is so much more entertainment around the park including a special Christmas show with the Peanuts gang in Camp Snoopy, Carolers and live performances of The Gift of the Magi and a Christmas Carol inside the Bird Cage Theater. Knott’s has unique touches for the season all over the park. 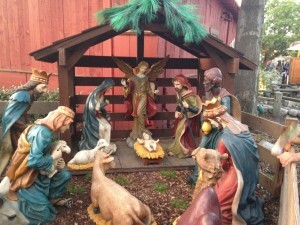 We were really impressed and surprised when we came upon this Nativity scene located just behind Santa’s Workshop, across from Big Foot Rapids. 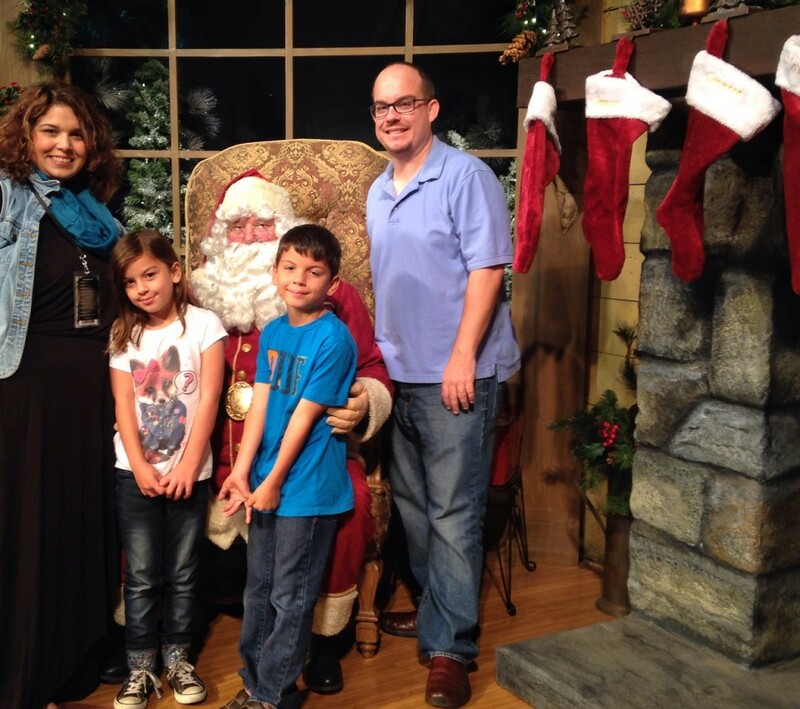 We also got to visit Santa’s workshop and tried some delicious pastries, cookies, eggnog and fresh roasted nuts. 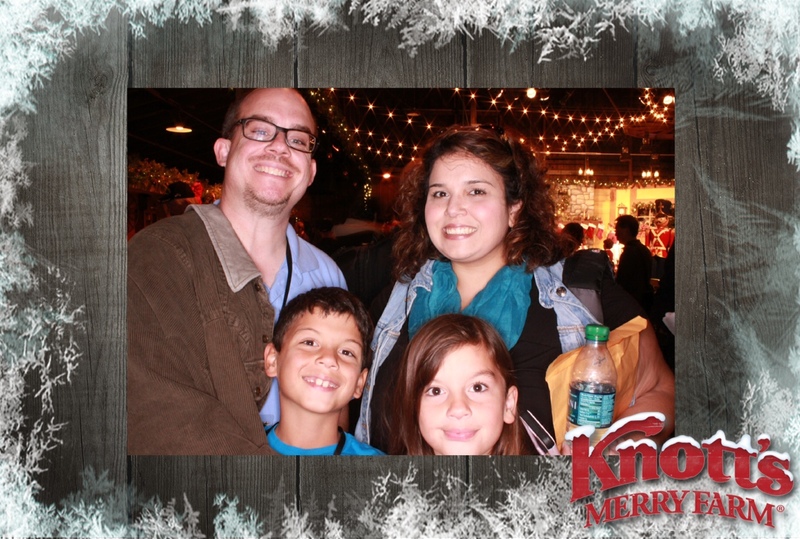 Knott’s Merry Farm is one of the best places to get the traditional American Christmas experience. Be sure to stick around at night for the tree lighting ceremony and calico Square where you’ll get visits from all of your favorite beagle as well as some of Santa’s elves and toy soldiers. After the tree lighting, walk on over into the Ghost Town’s Main Street to experience the all new light and snow experience. 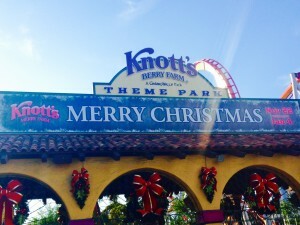 Knott’s Merry Farm runs daily now through January 4th. And just in time for Christmas, you can get season passes with no black out dates, for just six payments of just $13.25 and you get an extra ticket to allow you to come visit before 2014 ends. 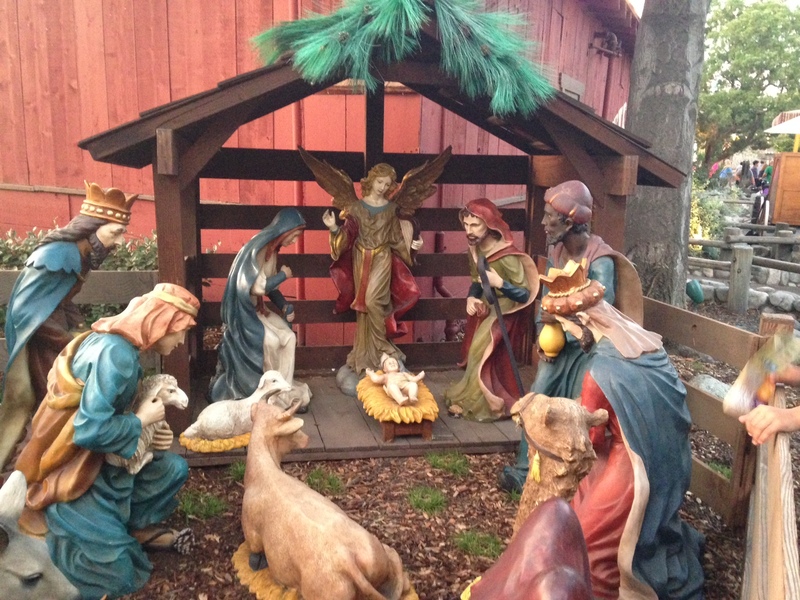 This entry was posted in Christmas, Knott's Berry Farm. 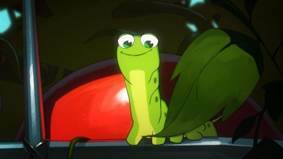 On December 1st, DreamWorks Animation’s Turbo FAST completes its first season on Netflix with five brand-new episodes. Throughout the season, we’ve seen the Fast Action Stunt Team take on many awesome challenges and now is your family’s chance to get in on some of action. Did you know that there has been a mystery character present in 24 of the 26 episode season and the Fast Action Stunt Team needs your help to find him. He’s a tiny worm…and while he may be easy to overlook at first, once you know about him, you’ll never look at Turbo FAST the same. The Worm has turned up in settings as varied as a sunny SoCal beach to a Tokyo shopping mall, from Tito’s taco stand to a hot-sauce commercial – and even in the Miss Teen Mudbug competition. We challenge your family to put on their Fast Action Stunt Team gear and apply teamwork to complete The Worm challenge. Here’s what he looks like and a few of The Worm’s appearances are below – can you and your family find all of them? With the whole season soon to be available for streaming on Netflix, here’s your chance to go on a worm hunt! Happy hunting. Also! Be sure to catch “VeggieTales in the House,” which starts streaming this Wednesday, Nov. 26! Enjoy your Thanksgiving and time with the family! This entry was posted in animation.